I go to the gym to lift weights twice a week. My gym is not a fancy expensive health club with espresso machines and Jacuzzis and lots of Spandex; it’s also not a black iron gym filled with big men, lots of weights, and chalk dust. It’s a city recreation center, so it caters to a diverse population. Every couple of months, on Tuesday mornings, a new group of young men (and the occasional young woman) turn up. I don’t know if they’re in the Navy, or trying to get into the Navy, but they have something to do with the Navy, and they’re trying to meet some sort of fitness standards. They have some sort of instructor or trainer who has a clipboard. 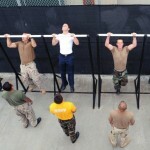 They do pull ups. My trainer and I watch them, count their pull ups, and make quiet comments about how many of their pull ups should count and how many should not. We try to guess how many pull ups the tall muscular guy in the red shoes is going to do. weird – was yr chair looking a joyride temptation for them or someone had one folded up in his backpocket? No, no, I told the story badly – it’s that they failed to notice me at all, and the trainer was saying that theoretically if some poor crippled person ventured onto the track, the Navy (or Navy wannabe) people would have to come off so as not to be a danger to this poor person. How horrible is that? I can tell you that I see that people in wheelchairs do get overlooked by half the population it seems, the other half make it a consious effort to be helpful. I was at the zoo with my kids the on Monday & I came out of the restroom with my son… Across the room, literally ACROSS the room, I see a woman in a wheelchair with her assisting dog TRAPPED in between the 2 doors while people are walking in and out. No one offered to help her, until I walked over and helped her. Her wheelchair had got stuck because the “Handicap” buttons were on the exteriors. She had a bump she couldn’t get over. It’s just odd to me that people could walk right past her struggling, and NOT offer to help her. I’m never going to understand it because I grew up in a household with someone with limited mobility. Hello, Ila, thanks for your comment! I see two issues that you’ve brought up. The first is the issue of people who use wheelchairs (or crutches, or walkers, or guide dogs, or whatever) being invisible. At this point, after years of using assistive devices, is to just laugh or shake my head or shrug my shoulders. The second is the issue of needing help. Again, after years of using assistive devices, I believe strongly that the onus is on the disabled person to ask for the help that he or she needs. In general (obviously I don’t know what the situation was for the woman with her service dog), it’s not reasonable to expect strangers to recognize that you need assistance, you have to articulate it to someone. It’s part of advocating for yourself and being in control of your needs. There’s nothing wrong with asking for help, but you can’t assume those around you will read minds. Thanks, Stephen! We’ll see if they are there this week. If it had been me I would have siezed the opportunity to attempt to run them all over with my wheelchair. You are right when you say that it is up to us to speak up either in asking for assistance or in correcting idiotic, stereotypical attitudes towards the disabled. I can’t get to a gym but I exercise every day at home. I commend you for working towards staying as fit as possible. I also really appreciate your input on my blog. I get precious few comments from other women in wheelchairs so it’s nice to hear your take on things. That would have been seriously fun! But I had a workout to do. I also really appreciate your input on my blog. Likewise! I’m enjoying reading your posts, and it’s really nice that you acknowledge all your commenters. You should have followed them. Keep making them feel “uncomfortable”, hehe, maybe just for a bit. :) It’s a shame people aren’t more aware. I actually was passed by someone using a wheelchair when I did my first (and penultimate) triathlon. I am hoping the fact that I was passed by this guy is not indicative of how horribly slow I am but of his general fitness. I saw that on your blog, and wondered if it was an everyday wheelchair or a racing wheelchair. If the former, then yes, it’s indicative of his general fitness. If the latter, then he’s a really, really slow racer (like me) and you shouldn’t worry about it being a reflection on you at all.